See all 25 comfy slipper styles in our exclusive Look Book! Keep your tootsies toasty in delightful style with these charming and creative crochet designs! 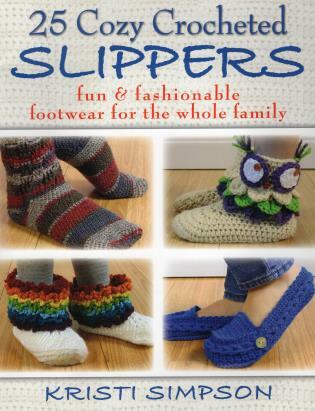 Enjoy crocheting twists on classic styles like Mary Janes and loafers as well as fun creations like elf shoes, owl boots, and your very own pair of ruby red slippers (satisfy your inner Dorothy!). Kristi Simpson designs crochet patterns with a fresh and modern touch. She has been a top online pattern seller for years, and her patterns have been published in international magazines including Crochet World, I Like Crochet, Inside Crochet, and Crochet!. She is the author of Sweet & Simple Baby Crochet (978-0-8117-1258-3, and Mommy & Me Crocheted Hats (978-0-8117-1327-6) and has more books in the works. Kristi lives in northern Alabama with her husband and five children. Check out more about her designs at www.KristiSimpson.net.